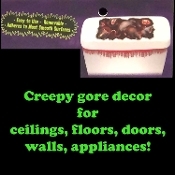 NEW Detailed SCARY, SPOOKY and GROSS... Fresh Decor from a Creepy Haunted House! HALLOWEEN Prop Decor Window Cling - Can be used on Toilet Tank, Ceiling, Floor, Wall, Mirror, Window, Door, Locker, Refrigerator, Dishwasher, Microwave, etc. Place this decal in kitchen, dining, bedroom, school locker, etc. as a creepy surprise for family and guests!